Especially in light of family business tax changes; and new technology advancements at CRA, a financial intermediary who can integrate advice on all aspects of a financial transaction – from banking to tax reporting - will be well positioned to help both new market entrants and older clients with tax problems. These bookkeeping courses help deliver high value advice that crosses all demographics. 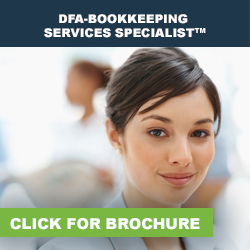 The DFA-Bookkeeping Services Specialist possesses the knowledge and skills to assist the family/small business owner with accurate data processing based on accounting principles and tax compliance throughout the evolving lifecycle of a business. With a focus on payroll and bookkeeping courses, the program places a heavy emphasis on tax planning for payroll, owner-manager compensation, GST/HST, managerial accounting, budgeting, cash flow and debt management and a strategic focus on analyzing the numbers for growth and eventual high-value transition. An important option is attendance at the CE Summits, a one-day instructor-led workshop held in November, January and May. It is of particular benefit to students who seek in-person, peer-to-peer learning. Click on each course title to see the detailed content description, key concepts and learning outcomes for the course. Courses above may be substituted by one or more courses listed below. 6 completed courses are required to earn a designation.